Are there more gins out there these days than aftershaves and socks? Whatever the answer, we’ve rounded up a selection of gin-related gift offerings that are surely more appealing and perfect for the gin lovers out there, or simply for those looking to escape the inevitable family dramas. 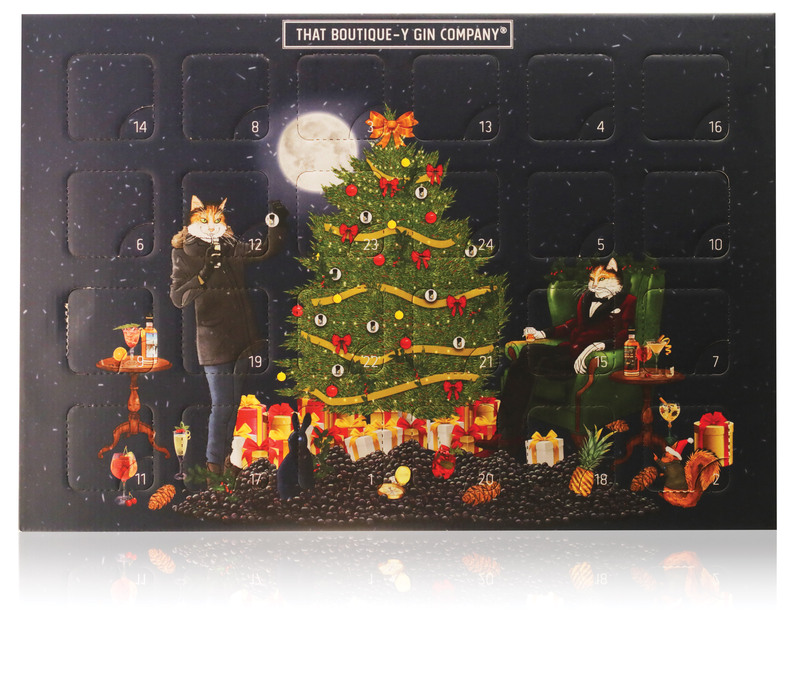 That Boutique-y Gin Company – they of creative gins selected from distilleries across the globe, with intriguing illustrations – have paired up with Drinks By The Dram to produce a 2018 Advent calendar with 24 different 3cl measures behind each door. Gins include Mojito Gin, Rhubarb Triangle Gin and Icewine Old Tom, just to name a few! Just when festivities seemed to have reached their limit, That Boutique-y Gin Co. have also continued their Yuletide Gin from 2017, a 47% ABV festive gin with notes of pine, ginger and rummy raisins. There are even gold flakes in the bottle to really distract your co-workers, or children (who possibly shouldn’t be near a bottle of gin). Just to top everything off, behind one of the Advent calendar doors is a 3cl of Yuletide Gin. Perfect. A festive offering from the award-winning Newton House Gin, based in Somerset in the UK. Available in a 5cl (shaped like a gingerbread person) or a 20cl bottle, the Mulled Gin is infused with seasonal spices. With aromas of Christmas cake, cinnamon and nutmeg, it’s an upfront and sweet offering that warms the heart and evokes Christmas in front of the fire. At an ABV of 38.5% it still packs a punch and will surely be perfect alongside mince pies and a hearty dollop of brandy butter. Cornwall’s Trevethan Distillery was re-born by Robert Cuffe and John Hall in 2015. Their three expressions; Cornish Gin, Chauffeur’s Reserve and Honey Oak come together in a gift-pack of 5cl bottles that are perfect for those who can’t decide which one they like best. Cornish Gin is smooth and goes nicely over ice, Chauffeur’s Reserve is 57% ABV and duly has more weight about it. Finally, the Honey Oak offers just a touch of earthy honey. Yep, probably best to grab the gift-pack and try all three. This barely touches the surface of The Lakes Distillery’s offering of gifts, with the range including spirit filled baubles, glasses and hip flasks. Our picks include the Mixed Gin and Liqueur Gift pack, which offers an introduction into the brand’s gin and range of liqueurs with its 5cl bottles, a set of liqueurs and balloon glass, perfect for serving as a fizzing cocktail option with that festive sparkling wine, and a set of crackers with a 5cl bottle of gin or liqueur inside. The gin opens floral, before citrus peel comes through, while the range of liqueurs includes Elderflower, Rhubarb & Rosehip and Sloe. The question is, will they last longer than the party hats? Although I’m disappointed there were not any jokes inside. Bullards Gin from Norwich in the UK has not only updated its award-winning range with the launch of an Old Tom, but it’s also refreshed its packaging too – so now it’s twice the gift. The Old Tom offers spice from pink pepper and has a gentle fruitiness underpinned with a little honey note. We can’t wait to try this one in some festive cocktails. A new addition to the Cotswolds range, Ginger Gin is the perfect option for a winter evening in front of the fire. Matured in the same barrels as the brand’s single malt whisky, it has fresh citrus notes and a candied ginger flavour. Honey-coloured, it goes well served neat over ice, or for the full winter experience, mix with warm apple juice.